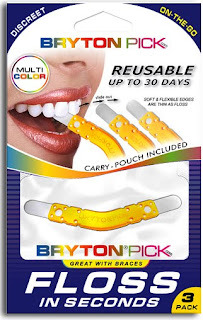 My favorite part of the Bryton pick is that it is reusable. 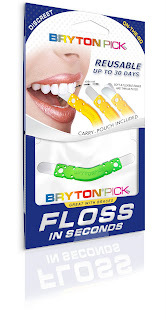 All of us in this house have tried the floss picks that you toss after a single use, but flossing with the BrytonPick not only saves you the hassle of traditional flossing, it saves money. They don't last forever, but each has a shelf life of about three weeks. Since my teen daughter has braces, I wanted her to try it and see what she thought. She was amazed at how easy it was to use and how much cleaner her teeth were vs traditional floss and a threader. Believe me...we are all about ease at my place! Designed, developed and tested by dental professionals. Re-usable up to 30 days (germ-resistand stainless steel). Cleanse with napking or water. Store in its cary-pouch. BrytonPick is 100% produced in USA at FDA registered facilities (QS-9000 / ISO9001 Certified)...YAY for made in the USA!!! My daughter loved this product so much that I went online and ordered some for her and some to giveaway to you, my wonderful readers! Yep, that's right....I am a'sharing with y'all! THREE (3) lucky readers will have a chance to win one of these amazing devices. And, because I like to make things EASY, to enter my little giveaway, just go to http://www.brytonpick.com and tell me what your thought(s) is/are on this product. That's All! Now, wasn't that easy??! :) This giveaway will be open until Sunday, Oct. 24 at 11:59pm. I'll choose the winners using random.org and send you an email. You'll have 48 hrs. to provide me with your contact info. Have a Terrific Thursday Everyone! Hey! What's that new ad I see wayyy up there??! Thanks for supporting Tracy. :) Don't you love her cards???? I've been ordering them for various events and get the BEST compliments on them. 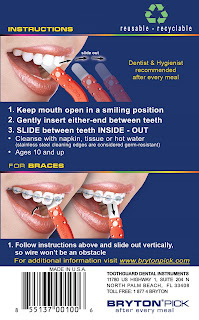 I like that it looks so much easier to floss and I love the fact that it is made in the USA!